Donegal and the Gaels served up a cracker of a game to make for a tremendously exciting finale to the day on Sunday. Donegal had added Ger Brennan of Dublin fame as well as Derry’s Eoin and Paddy Bradley to the ranks. It was the proverbial game of two halves with the Gaels lording it over their opponents in the first and Donegal controlling the second. It seemed as the Gaels had shot their bolt in the first half as in the second it was all Donegal, with an exhausted Gaels team desperately hanging on. But hang on they did thanks to late points from substitute Ronan Kennedy and move up in the standings. Sean Conneely about to score the Gael's first goal. The Gaels were clearly up for this game and played with a high intensity from the get go. The westerners battled for every ball and their running off the ball was constant. Ryan Hyde lined out in the middle of the field and broke the ball well, with Gaels runners picking up almost everything. After Donegal opened the scoring with a point each from corner forwards, Paddy and Eoin Bradley, the Gaels kicked into high gear. Sean Conneely netted after picking up on a rebound from a high ball into the box, and Jack Kielt pointed to follow up the score. Conneely added another point and the Gaels were flying. Two long range dead ball efforts from Fintan Cooney had the Gaels looking at a 10 points to 3 lead. Eoin Bradley had moved deeper out the field and tallied a point with John Campbell adding another for Donegal who could not settle into the game. Just before the half time whistle Hyde burst through the defence and buried the ball into the top corner. At the break the Gaels were ahead 2-9 to 0-4. Brian Donnelly rises highest for this kickout. This Donegal team though has too much quality to be counted out and came out all guns blazing in the second half. 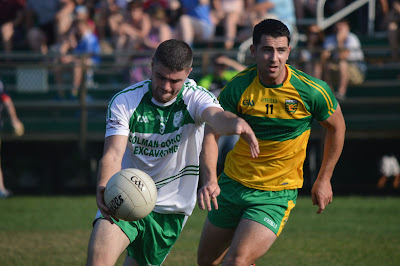 After the northerners outscored the Gaels three points to one to set the tone for what was to come in the second stanza, Eoin O’Connor ran through virtually unchallenged to blast past Eoin Connolly and it was game on again. This time it was Donegal who looked unstoppable while the Gaels lost their way. Some chances that fell to the westerners were badly missed, and badly needed, and at the other end Paddy and Eoin Bradley made hay with three points unanswered. Entering the last quarter it was the Gaels hanging on by a thread to a one goal lead. Changes were made with Ronan Kennedy, Jack Wyndham, and Noel Graham entering the fray for the Gaels and Darragh Kavanagh for Donegal. The long ball into the isolated corner forwards from Derry continued to work for Donegal and the deficit was reduced to a single point, and it looked as though Donegal would pull off a massive comeback. However it was two late scores from Leitrim man, Ronan Kennedy, that kept the Gaels noses just about ahead when nobody else in a green and white shirt could find the space between the posts. A big win for the Gaels, however, once this Donegal team settles into the remainder of the championship they will be hard to beat. Donegal: B. Flynn, D. Monagle, J. Noctor, R. Dunleavy, G. Brennan, C. Russell, R. Caldwell, B. Donnelly, J. Campbell, E. O’Connor, G. Gallagher, P. Bradley, E. Bradley. 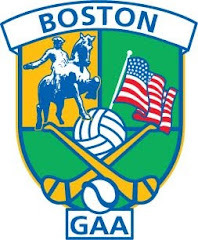 Gaels: E. Connolly, L. Cullen, A. Girvan, F. Cooney, R. Caffrey, D. Larkin, R. Hyde, B. Boylan, S. Conneeley, C. Sheehan, J. O’Brien, R. Rafferty, J. Kielt.